The name of this place, Osteria via Stato, was familiar enough. But I hadn’t heard anyone raving about it, or really even talking about it. So it was under my radar for a long time. 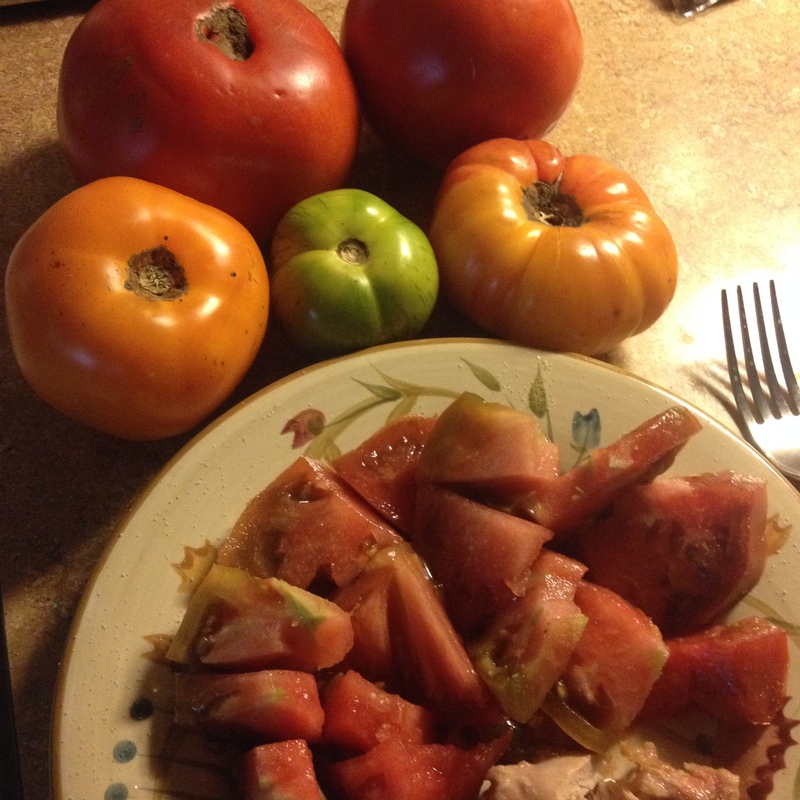 Through a friend recently, heard about their Heirloom Tomato Dinner. Sounded great (and at $75 per person including wine pairings, definitely not overpriced by Chicago standards, so we signed up. And what a delightful discovery. Even from outside it looked promising. The patio was fairly busy on a warm Wednesday evening, plenty of outdoor diners smiling and looking very comfortable. Then inside, the welcoming began in earnest. The whole place is full of dark wood and soft lighting—perfect ambiance in my book. The friendly concierge helpfully pointed out the ladies’ room and then the door to the private room where the Heirloom Tomato surprises awaited. In the room, amiable-looking folks mingled and sipped wine or little tomato-based, sweet-and-spicy cocktails invented for the occasion, and servers bustled efficiently around doing last-minute prep. Antipasti, both passed and served at table, set the stage. Delicious little bites – oh, how creamy the Gorgonzola cheese melting under the square of crisp bacon on one—preceded the family-style platters of heirloom tomatoes nestled in marinated rings of Tropea (Italian red) onion and crowned with hand-made Italian Buffalo Mozzarella (SOOO good), big plates of Pappa al Pomodoro (local tomato and bread soup – num! 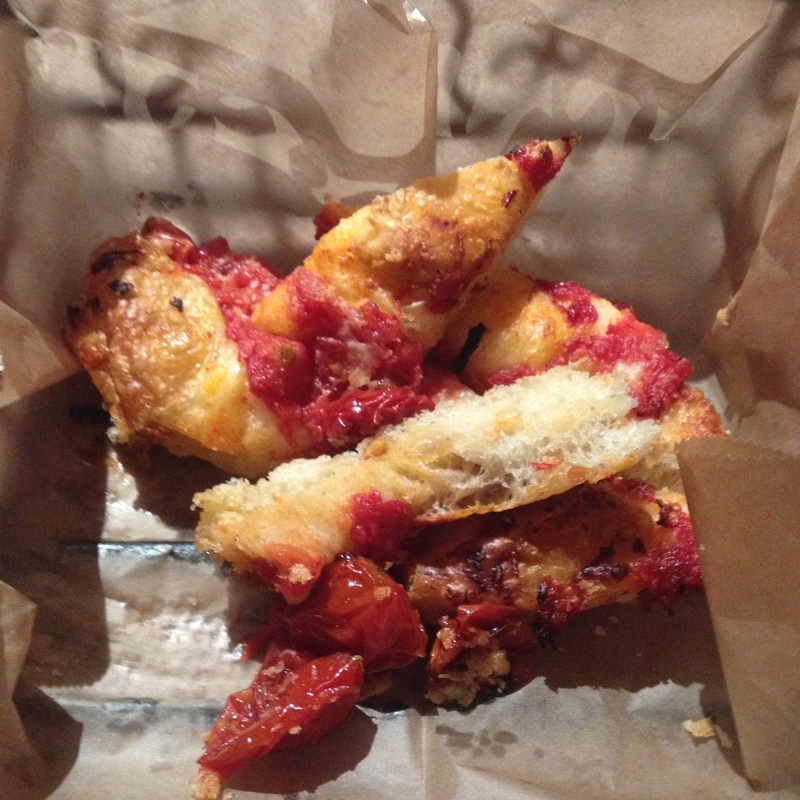 ), and super-thin-crusted pizza of Creminelli Coppa (Italian cured meat similar to prosciutto), roasted tomatoes and Pecorino cheese. Oh, yes and baskets of fluffy-inside, crusty-outside Italian bread and moist, salty slices of tomato-adorned focaccia always on the table, along with the roasted-garlic olive oil and dishes of olives. The pairing was a delicious Soave Pieropan 2014. Okay, now we get to the primi (first course). 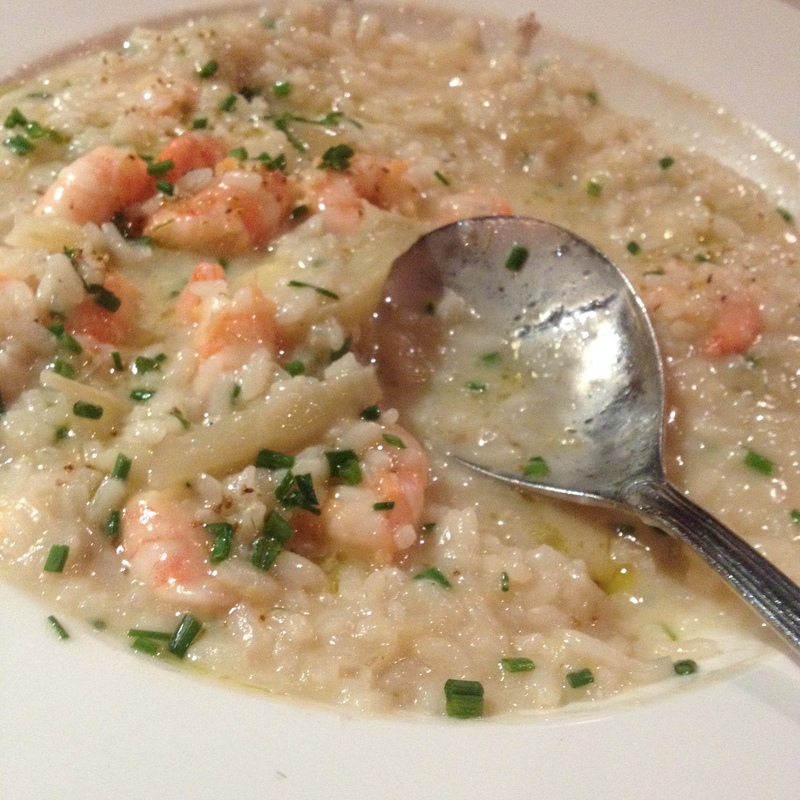 Utterly lovely, light and creamy risotto made with Laughing Bird Shrimp from Belize and laced with chunks of fennel and flavored lightly with tomato. Simply excellent. We both wanted to keep eating this one. Next came family-size platters of both secondi courses—pan-roasted large cod in a spicy, light tomato broth so good I felt like drinking it; and braised, forkably tender lamb shanks bathed in a deeply flavorsome, rosemary-scented red-wine sauce along with irresistibly succulent roasted tomato slices and potato puree I couldn’t get enough of in each bite. Each in its own way was spectacularly good. Can I drink that tomato broth? The wine that came with the secondi deserves a whole paragraph to itself. The Tormaresca Trentangeli 2012 was extraordinary—rich-hued, velvety in the mouth, and deeply gratifying to the palate with a long, smooth finish. A perfect companion to the food. I dream of acquiring a case of this in the hopefully near future. What a surprising treat as your next hostess gift (see earlier post about Antinori wines) – and if Wine Searcher is on target, a bargain in the price range of $15. Well, and finally we come to the Dolce. I am not usually a dessert person, but I simply had to try each one of the specialties on offer here. Gelato, which I normally can live completely without, was so flavorful, creamy and rich that I had to try several flavors, each more lovely than the one before. The cookies—sandy-sweet wafers sandwiched with fabulous chef-made heirloom tomato jam, slices of almond-studded chocolate-covered soft crackers, and dark chocolate truffles dipped in powdered sugar—were impossible to resist. And the fact that the server brought over a slender chocolate bar wrapped in heavy paper and smashed it with a hammer to break it into smaller pieces made it seem impolite not to try some chocolate—lovely. Of course, the pairing of Saracco Moscato d’Asti 2013 made a bubbly light companion to these indulgences. Congratulations to Chef David DiGregorio and his crew for taking the treasures of the earth lovingly grown by Nick Nichols of Nichols Farm & Orchard and transforming them into dishes fit for the gods. And thank you to Nick Nichols for investing the love and labor to coax these gems from the earth against all weather and natural odds. In case you’re interested, Nichols Farm has a CSA (community support agriculture that delivers fresh vegetables to Chicago and suburbs). And thank you to the excellent servers and helpers at Osteria via Stato. They were efficient and gracious and helpful in every way.